From its establishment in 1958 by the Sisters of St. Francis, Lourdes University has provided an excellent Catholic and Franciscan education. 1916 Bishop Schrembs formally requests a Toledo Province of Rochester Sisters. In November, 23, Rochester Franciscans were selected to be the original province members. The group was under the direction of Mother Adelaide Sandusky, the newly appointed Provincial Superior. 1917 Three farms located in Sylvania, Ohio are purchased. This property would one day become the home of the Franciscan Sisters. 1942 An extension campus of St. Teresa in Winona, Minnesota is established on the Sylvania-Franciscan campus. 1958 Lourdes Junior College is founded. Mother Justinian Warpeha, OSF is the first President (1958-1962). 1964 The College receives accreditation by the North Central Association of Colleges and Schools during the presidency of Sr. M. Remigia Kostick, OSF, 1962 – 1972. 1969 Lay women are admitted to the Junior College. 1973 Lourdes College becomes independently incorporated. 1975 During the presidency of Sr. Rosaria Petra, OSF, 1972 – 1981, the first men are admitted to Lourdes College. Educational opportunities are also extended to students from the St. Vincent School of Nursing in Toledo and the Providence School of Nursing in Sandusky, Ohio. 1977 The Franciscan Sisters and area business and civic leaders hold extensive discussions regarding the need for a Catholic college following the closing of Mary Manse College. These discussions lead to a feasibility study regarding a four-year college. 1978 An Associate Degree for Occupational Therapy Assistant receives approval. 1979 A Lifelong Learning Center is founded by Sr. Ann Francis Klimkowski, OSF, and offers a wide range of adult education classes. 1981 Under the guidance of Sr. Marie Andrée Chorzempa, OSF, (acting president 1981 – 1983) the first bachelor degree programs are developed in religious studies and individualized studies. The Board approves move to a four year college. 1982 The College is authorized by the Ohio Board of Regents and receives accreditation from North Central Association for baccalaureate degrees. 1983 Sr. Ann Francis Klimkowski, OSF, becomes president of the College (1983 – 2000). 1986 Two more bachelor degrees are added to the curriculum: Bachelor of Arts and Bachelor of Science in Nursing. 1991 The Associate Degree for Early Childhood Teacher Education is approved. 1993 Full complement of majors within the Bachelor of Arts degree are added. 1999 Authorization from the Ohio Board of Regents and accreditation from North Central Association are received to offer a Bachelor of Science degree. 2000 Dr. George Matthews becomes president of the College (2000 – 2003). 2002 Graduate degrees in Education and Organizational Leadership are accredited. 2003 Dr. Robert Helmer becomes president of the College (2003 – 2012). 2007 Lourdes dedicates Delp and McAlear Halls. Graduate degree in Nursing is accredited. 2009 Graduate degree in Theology is accredited. 2010 Lourdes welcomes first residential students and launches inaugural intercollegiate athletic season. 2011 Lourdes College transitions to Lourdes University. Graduate degrees in Business, Liberal Studies and Nurse Anesthesia are accredited. 2012 Dr. Janet Robinson becomes interim president of the University (2012 – 2013). 2013 Lourdes offers inaugural study abroad courses.Dr. David J. Livingston becomes the ninth president of the university. Lourdes breaks ground on Phase I of the mid-campus expansion. 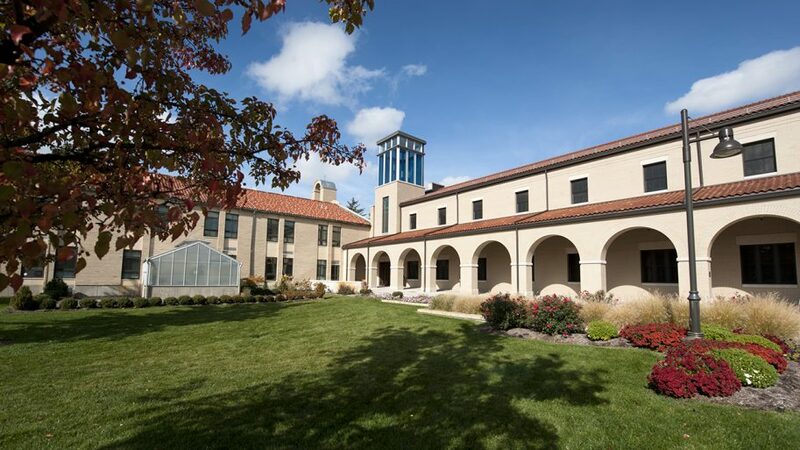 2014 Lourdes’ mid-campus opens connecting the historic and residential campuses. 2016 Dr. Mary Ann Gawelek becomes the 10th president of the university. Lourdes officially opens and dedicates the Russell J. Ebeid Recreation Center.